Edited by Ian Collier. Peter Roe Booklet 16. The proceedings of the Tolkien Society Seminar 2009. N.B. the print edition has sold out but the e-book version is still available. 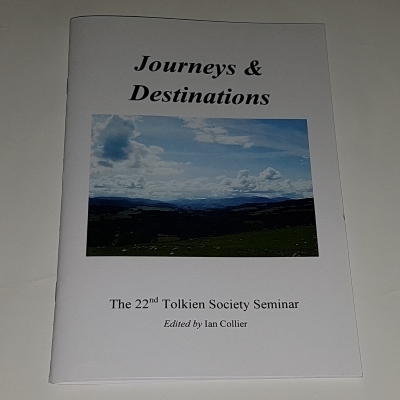 Journeys & Destinations is the collected papers from the 22nd Tolkien Society Seminar held at the Sir John Soane’s Museum, London, in June 2009. The Society’s seminars are an invaluable source of interesting, intelligent and sometimes unusual Tolkien scholarship, with the papers being followed by fruitful discussions. The 54-page booklet is edited by Ian Collier, with a cover photo provided by Julie Sinclair, and brings together the papers given for others to enjoy the papers given by the likes of our Archivist Dr Pat Reynolds, Sue Bridgwater, Anne Marie Gazzolo, Dr Antonio Sanna, and Mick Ennis and the children of the Ironville and Codner Myth and Magic group. You can find the e-book version under ISBN 978-0905520230. The Kindle version is available here.